Wow. The end is almost here for this project in 2013. A few details – soup for lunch, dessert at Pizza Express, Gav and Bud at Yorkshire sculpture park, ready to bake croissants, games, a selfie, the gingerbread house, sweet girl and her Christmas tree, Buddy’s interested in something, a new to my typewriter, the garden and chocolate Christmas cake. You will notice that there are only twelve not fourteen photos. I’m okay that I missed two. It happens and I shall survive…..lol. Only two photos for the year left to share. I finished this book several weeks ago but forgot to post it! The final book in the Legend trilogy. It was better than the second book but I still found it a little padded out. Glad I read them though. Interesting characters and world she built up for our reading pleasure. This idea has been around quite a while now. Here is a link to Ali’s post about her word this year. I have so far resisted the urge to jump into this year-long project. I’m not sure why. I even sat in November 2012 running through words in my head trying them on for size to see if I could live with a word and take it to my heart. It wasn’t right then but it is now. I saw the word ‘Listen’ on Karen Grunberg’s blog, it shouted out to me and I was hooked into this idea of one little word. I am excited to begin letting this word sit with me, be with me. Listen has so much to show me. There is so much to hear if I take the time to tune myself in. Listen to the ones I love. Listen to what people say. I literally and figuratively talk to myself constantly. But do I really hear what I say? I think this was my jumping off point, the fact that a big flaw of mine is not actually paying attention. But that is just the tip of the iceberg. My journey with this word is already surprising me and we have only just taken our first step. 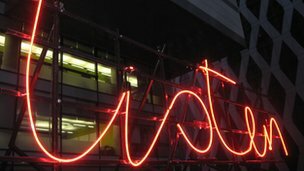 That amazing neon sign was commissioned for Radio 4’s Front Row programme. I love crossing things off my list and today I’m sharing two. Hoorah! Make a gingerbread house. Check. I used a recipe and template from an old Good Food magazine but there are plenty online and if I ever do this again I’d go for a different one. I must admit that this whole project was a challenge. I made the house a few weeks ago. The dough was very tricky to roll out, it kept breaking up, so by time I had cut all my templates I was really happy to have that part finished I forgot to cut windows in the dough! I used royal icing to stick the walls together. Can’t remember if I’ve ever used royal icing before I found this a challenge too. Here are the walls ready for the roof. And once side of the roof going on. Even though this is not my best work I do love it especially the little log pile at the back of the house. What I have learned from making this festive treat is that it takes deep breaths and patience. I would use more colour coordinated sweets if I made one again and probably copy a recipe rather than giving it my own twist. But at least it’s crossed off and I have used royal icing. And the next thing to get crossed off the list is make a chocolate christmas cake. It is very delicious and very like a fruit cake with a hint of chocolate. My favourite part is the big juicy prunes. I probably should have chopped them smaller but I like that chewy texture. I’d definitely make this again. And day seventeen. Wooden hearts are from Studio Calico. This was a fold out page I had prepared in advance. And day eighteen. No photos today. A couple of major things happened. First it was a milestone for Gav and I. Twenty One years since we got together at a works Christmas party…….. So I just added some glittery words to tell that story. And the other big thing? Well I got the worst migraine ever! Came home from work and curled up in bed. Them’s the breaks. And day nineteen. A photo of Buddy hogging the fire and a handrawn line around the back of the envelope of day eighteen. With another wooden heart. 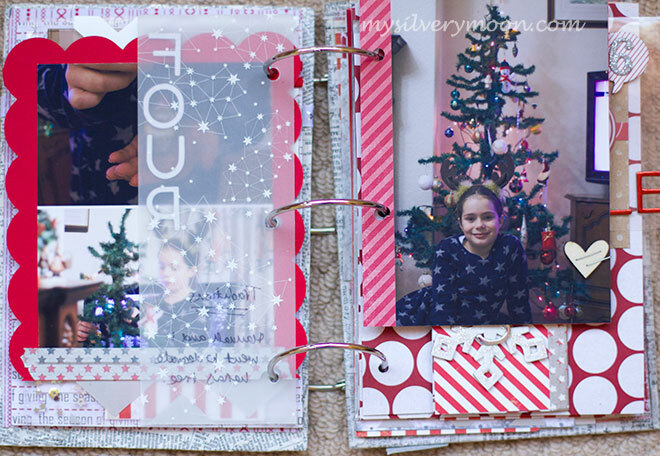 December Daily™ is a memory keeping idea and album developed by Ali Edwards. 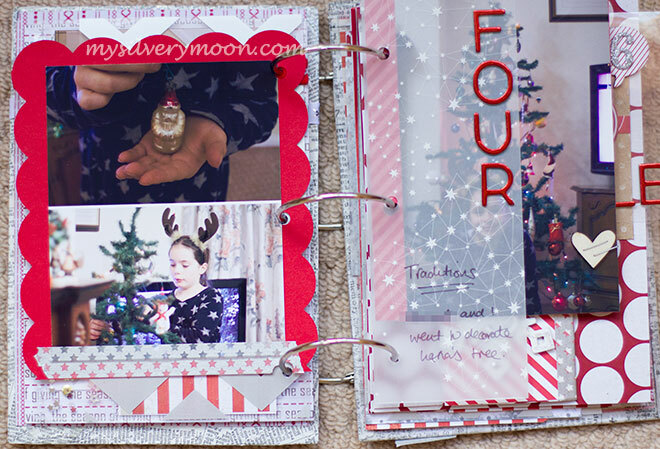 December Daily is a trademark of Ali Edwards Design Inc. Here we go with a catch up on the photo a day. Christmas things, normal things a good mix of life those two weeks. Here we go catching up again. 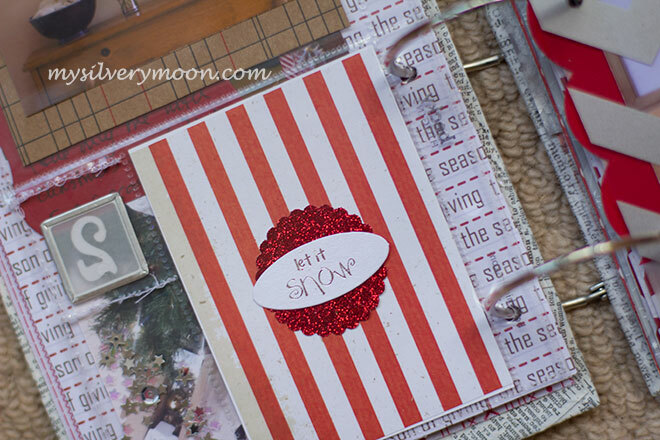 I used a Project Life 3 x 4 card from the seasons kit for my writing on the 10th. Liked the red striped edge. I left that adorable velum from Dear Lizzie plain. A simple enlarged photo of the living room mantle for day 11. The left of this page is from the 11th too. In past years I have been hung up on making a spread be only from the one day but I let that go this year. after all in years to come will I care what day I was pouring over the Radio Times? And on the right day 12. This was one of the fold out pages I prepared in advance. I tied the bakers twine around the flap to add a bit more interest. There is the journalling for that day a photo and part of the sleeve from my Egg Nog Latte on the inside. A photo from the 12th of the early morning sky on the left and day 13 is just a little writing. The only photo I took was really too blurry so I went with the story of the christmas music I’m listening to. There was lots going on but I didn’t have anywhere to write so I summed up all the events with a few handwritten words along the edge of the two photos. Sometimes less is good enough. Here is day 8 and 9. 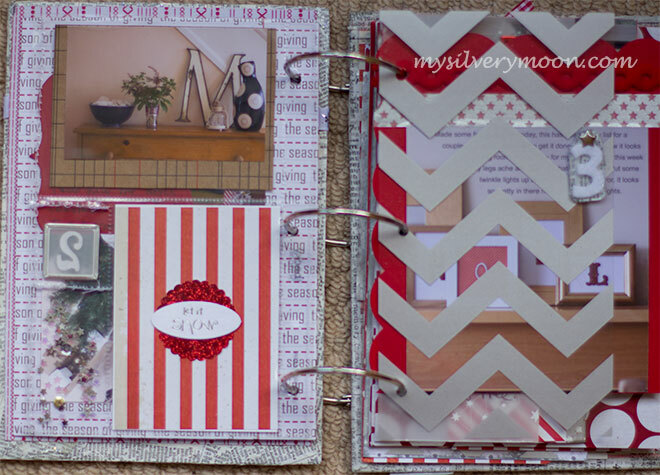 Always have to have a red envelope in the album somewhere. 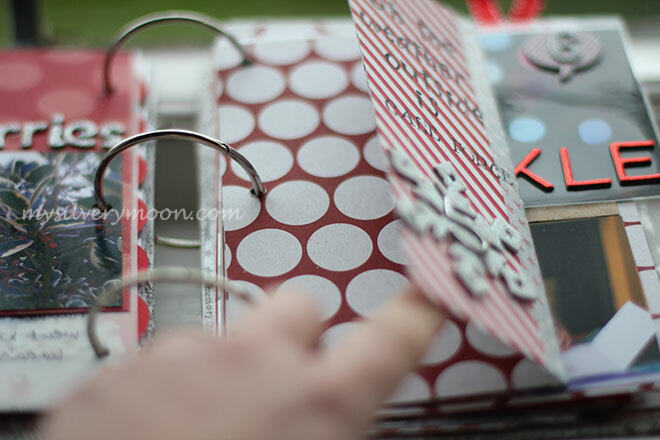 Just love tucking notes inside these. The photo is of a coffee stop before Gav and I did a bit of Christmas shopping. And a look at what’s inside the envelope. And onto day 9. I wrote on the back of the envelope with a white gel pen. It’s a bit blotchy but hey ho. The story today was all about that cup in the top right photo. 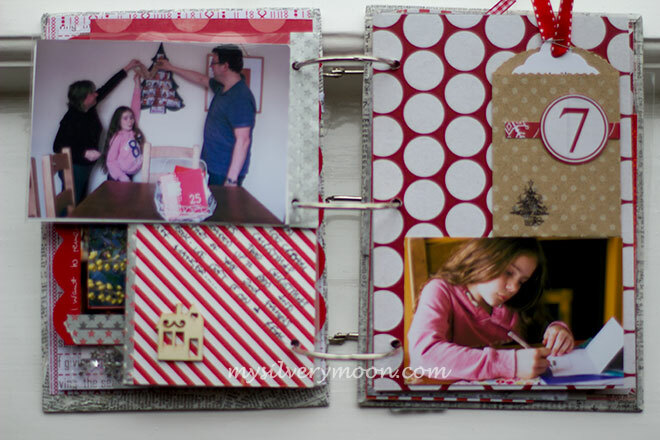 The photos are added to one of the cut down page protectors. I added text to one and one of Ali’s hand drawn boxes to the other before printing. I also added a little wooden tree to the teeny empty pocket. I stapled it inside to hold it in place. Hope to have regular posts coming again after our technical issues. Thanks for popping back to say hello. 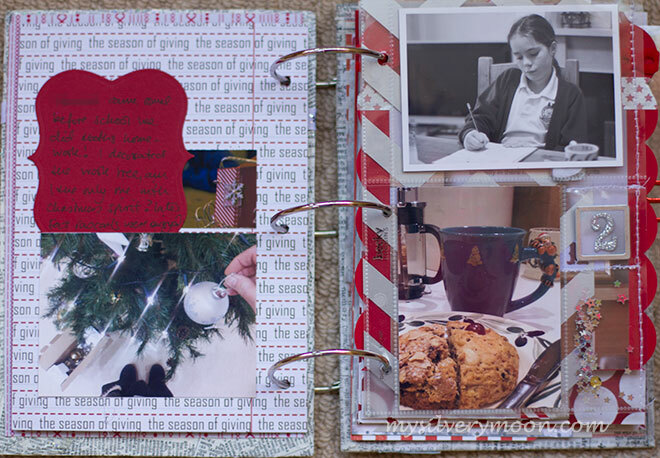 x ————————————————————————————— December Daily™ is a memory keeping idea and album developed by Ali Edwards. 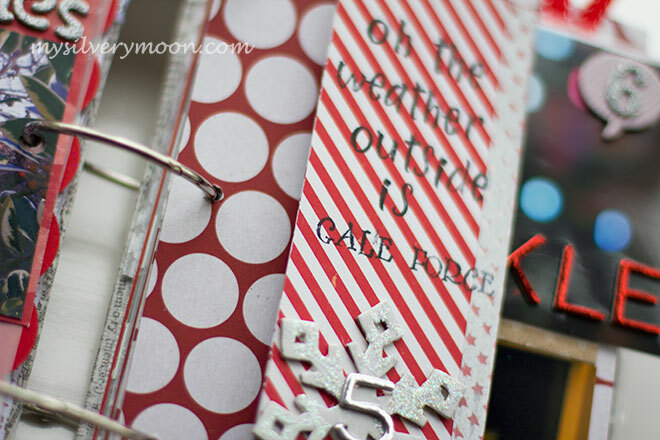 December Daily is a trademark of Ali Edwards Design Inc.
Hello to three more days lived, enjoyed and documented. On Thursday we had a very windy day here in Leeds. Lots of the north of the UK was hit by a huge storm, we escaped with just strong winds. I thought stamping that line from the Christmas song would be a good way to tell that story simply. 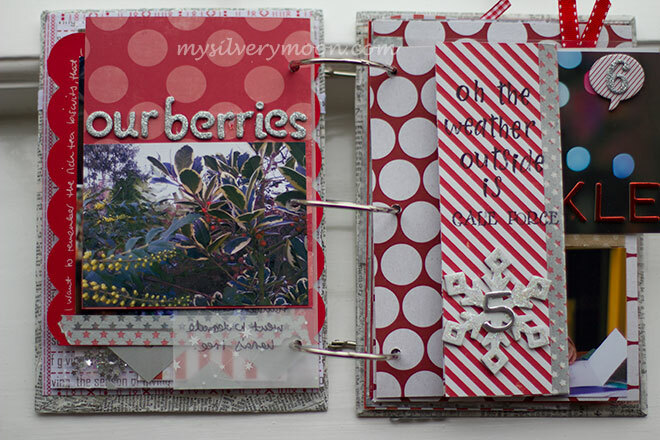 The photo of the berries was actually taken the day after on the 6th but I included it on this page. Although I have all that space to write in under the flap I made I haven’t written anything yet. But I will. I put the photo of the christmas lights into the pre-made pocket they just fit so well with the word twinkle I had also pre-prepared. We all had a gift to open the following day and H came up with the idea of a self timed shot so we could all be captured picking out our advent treat. 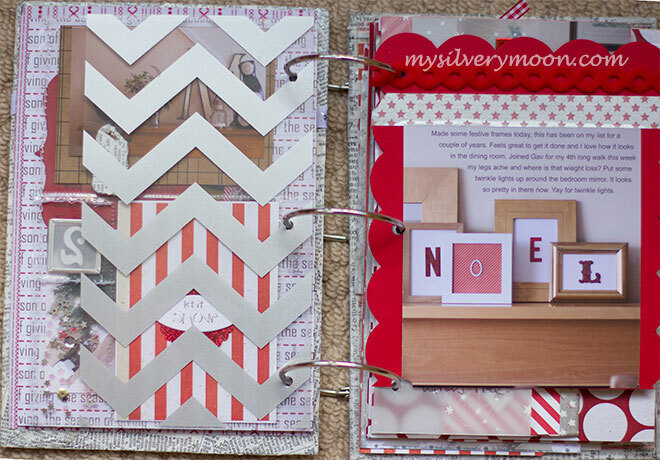 Just adore the layers that are starting to appear on the bottom left of the album. For the rest of the seventh I added a tag to the little envelope with my journalling on and a photo of H writing Christmas cards we made. Popped some writing directly on the photo of the Noel frames and then added some felt ribbon and star washi tape to echo the silver transparency. Teamed up with H on Wednesday when we went to my Mums to help trim her tree. I need to add some writing to this page. I was only later today when I thought about that hours worth of fun we had and realised I hadn’t really documented my thoughts about it. Will probably write around the photos like a border. Love the look of that vellum with a photo underneath. And there we are caught up.